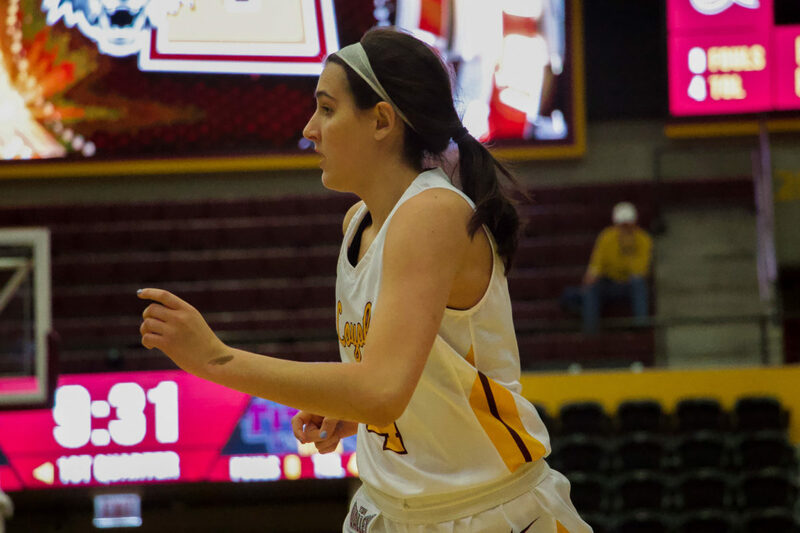 Nick Schultz | The Phoenix Sophomore forward Abby O'Connor notched her fourth career double-double against Bradley Feb. 3. Despite an early lead, the Loyola women’s basketball team (10-10, 4-5) fell to Bradley University 69-56 at Gentile Arena Sunday afternoon. First-year forward Allison Day and sophomore forward Abby O’Connor both registered double-doubles in the effort. Day tallied 18 points and 11 rebounds while O’Connor had 17 points and 11 boards. Bradley entered the game sitting at 14-5 overall and 4-4 in Missouri Valley Conference (MVC) play. The Braves were tied for fourth in the MVC with Loyola, but with the win they now sit alone in fourth place and the Ramblers fall to fifth in the 10-team league. Despite the loss, Achter said she was proud of the performance and resiliency the players showed through the game. After Loyola took a five-point lead in the first five minutes of the game — its only lead of the game — Bradley was able to tie it up before the end of the quarter. The second quarter showed more aggressive offense as both teams improved their shooting percentages. Day was the only player in double digits for the Ramblers in the first 20 minutes as the Braves led 45-42 heading into halftime. The third quarter saw better three-point shooting from both teams. Only five triples were made during the first half and six total were tallied within the first couple minutes of the second. While the Ramblers outscored the Braves 18-17 in the quarter, they were unable to pull ahead as they entered the final quarter of the game. Day found herself in foul trouble and sat out the beginning of the fourth quarter. Without its leading shooter in the game until later, Loyola was unable to connect with the basket, only shooting 2-for-4 from the field and 0-for-1 beyond the three-point line. With 8:58 left in the game, Loyola junior guard Tiara Wallace narrowed the gap to two points, but the Ramblers were never able to gain momentum. The Braves pulled out a 69-56 win, ending Loyola’s five-game home winning streak. Next up, the Ramblers are scheduled to take on University of Northern Iowa Feb. 8 at Gentile Arena. Tip-off is scheduled for 7 p.m. and the game will be broadcasted on ESPN3.